The base of a denture could be either metal or acrylic and the replacement teeth are made to mimic the shape and colour of your natural teeth. 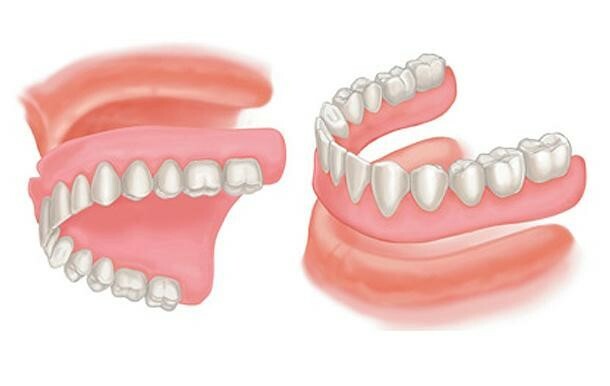 For patients that are edentulous, complete dentures will replace all their missing teeth, and for those with some natural teeth, partial dentures are used to replace the teeth that have been lost. Dentures are removable artificial replacements for missing teeth that that could have been lost from trauma, tooth decay, or gum disease. 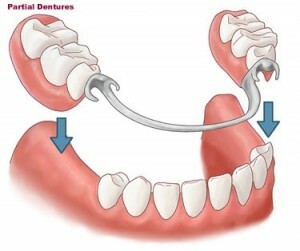 Dentures can be taken out of the patients mouth and put back in. While dentures take some getting used to and will never feel exactly the same as your natural teeth, today’s dentures are more natural looking and more comfortable than ever before. The base of a denture could be either metal or acrylic and the replacement teeth are made to mimic the shape and colour of your natural teeth. For patients that are edentulous, (have no teeth left) complete dentures will replace all their missing teeth, and for those with some natural teeth, partial dentures are used to replace the teeth that have been lost. Your dentist will help you choose the type of denture that is best for you based on whether some or all of your teeth are going to be replaced and the cost involved. With full dentures, a gum-coloured acrylic (a type of plastic) base fits over your gums. The base of the upper denture covers the roof of your mouth (your palate), while that of the lower denture is shaped like a horseshoe to accommodate your tongue. Dentures are custom-made for each patient in a dental laboratory from impressions taken by the dentist of your mouth. Your dentist will determine which of the three types of dentures below would work best for you. Every person is different, and as such, some people adjust much faster than others to dentures. Eating and speaking with dentures might take a little practice. Minor irritation or soreness is also not unusual. If you experience irritation, see your dentist. A conventional full denture is fitted in your mouth after all your natural teeth have been extracted and healing has taken place. Healing could take several months, during which time you are without teeth. Measurements are and impressions (moulds) are taken of your mouth by your dentist over a number of visits. At the last appointment, your natural teeth are removed, and your new denture/s are inserted at once. While immediate dentures offer the benefit of never having to be without your teeth, they must be relined (new pink material is put in your denture by the lab after your dentist has taken a new impression) several months after the denture is first issued. The reason is that the bone supporting the teeth reshapes as it heals, causing the denture to become loose.